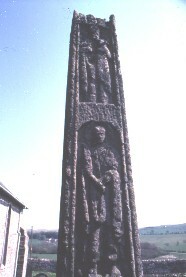 View of upper half of west face of stone shaft, dated to the first half of the eighth century. At the top the first figure is enclosed in a square-headed panel, edged on three sides by a fine roll moulding, and is facing out. He has a lamb in his left arm and his right hand emerges from a fold of drapery and seems to be pointing across his body to the lamb. The lamb is haloed, and its face is turned towards the viewer. The human figure does not seem to have a halo, and is male as there are surviving traces of a beard and moustache. The next panel depicts Christ in Majesty. This panel is round-headed and edged on the sides by fine roll mouldings. It encloses a standing frontal figure, who is identified as Christ by the runic inscription above this panel. He is standing on the heads of two beasts. His face is surrounded by a large halo, which may have faint cruciform incisions. He wears a long garment which covers his shoulders and possibly has an under-tunic. These garments hang in heavy folds to his ankles. The animal heads that he is standing on come from the opposite corners at the base of the panel and their muzzles touch in the centre.